摘要 目的研究FLT3基因的内部串联重复(internal tandem duplication,ITD)突变与急性白血病的关系及临床意义.方法采用PCR方法分析143例急性髓系白血病(AML)、25例急性淋巴细胞白血病(ALL)、2例急性杂合性白血病(AHL)、17例骨髓增生异常综合征(MDS)和7例慢性粒细胞白血病急变期(CML-BC)患者骨髓单个核细胞中FLT3基因外显子14和15中ITD突变,分析FLT3-ITD阳性AML患者的临床特征及疗效.结果143例AML患者中37例(25.9%)FLT3-ITD阳性,其中53例M2中10例、40例M3中15例、20例M4中4例、23例Ms中8例.在25例ALL、2例AHL、17例MDS和7例CML-BC患者中未检测到FLT3-ITD突变.对其中5例特征性突变测序结果显示,ITD位于外显子14,长度为21～60 bp,3例为单纯串联重复,2例同时出现插入序列,均未改变FLT3阅读框架.临床研究表明,FLT3-ITD突变在染色体核型正常患者中占有较高比例(P＜0.05),FLT3-ITD阳性患者外周血白细胞数高(P＜0.05),化疗后完全缓解率低(P＜0.05).结论FLT3-ITD突变多见于M3、M5患者,为框内突变(In frame mutation).FLT3-ITD阳性的AML患者外周血白细胞数高,化疗后完全缓解率低. Objective To evaluate the prevalence of FLT3 mutation internal tandem duplication in acute leukemia(AL) patients and its significance. Methods Genomic DNAs from 194 cases of AL were screened by polymerase chain reaction (PCR) and gel electrophoresis for FLT3 ITD mutations. Results FLT3 ITDs were found in 37(25.9%) of 143 de novo acute myeoloid leukemia(AML) patients , including 10/53 of M 2 , 15/40 of M 3 , 4/20 of M 4 and 8/23 of M 5 . Significantly more FLT3 aberrations were found in AML M 3 and M 5 (P<0.05). 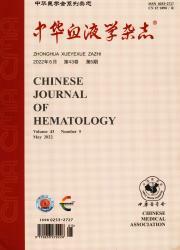 No FLT3 ITD was found in 25 acute lympoid leukemia (ALL), 2 acute hybrid leukemia,17 myelodysplastic syndromes and 7 chronic myelogenous leukemia in blast crisis. Sequence analysis of 5 cases with abnormal PCR electrophoretic patterns revealed that the ITDs were located within exon 14 from 21 bp to 60 bp, in 3 cases the ITD was a simple tandem duplication, and in 2 cases the ITD was tandem duplication with insertion, but all of the above ITD did not altered the FLT3 reading frame. FLT3 ITD was associated with a higher peripheral white cell count(P<0.05) and a lower complete remission rate(P<0.05), and was more prevalent in patients with normal karyotype(P<0.05). Conclusion FLT3 ITD mutation occurs with a significant percentage in AML M 3 and M 5 patients. Sequences of the mutants are in frame mutation. FLT3 ITD mutation was associated with a higher peripheral white cell count and a lower complete remission rate.